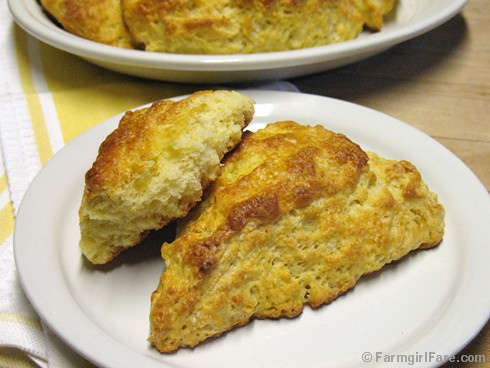 These oversized scones are crunchy outside, moist & tender inside (recipe here). It's citrus season! Meyer lemons are beautiful little fruits that are mostly grown on backyard trees, but their rising popularity in recent years means they can often be found at farmers' markets in warm climates, as well as at natural foods stores and supermarkets around the country. They're sweeter, less acidic, and have thinner skins than regular lemons. They also have a wonderful floral scent—and make delicious scones. If you can't get your hands on any Meyer lemons, these scones—which freeze beautifully—are still very nice when made with regular old lemons. Or you can even use oranges instead. This recipe is a variation of the traditional currant scones I used to sell at the little bakery cafe I had in my previous California life, back before I moved to the wilds of Missouri and became an enthusiastic but clueless farmgirl. British ex-pats loved them. They taste great plain, but you can fancy them up by adding currants or raisins and/or sprinkling coarse sugar on the tops. Butter, berry jam, and a proper pot of your favorite English tea are optional. I recommend serving them warm. © FarmgirlFare.com, where homemade scones are always in season, but they're especially nice to cozy up and munch on during winter. I absolutely love scones and these sound downright delightful! Thank you so much for sharing, I've already pinned them and I can't wait to make them!